Trade-checker season has arrived - which do you use, and why? Well, folks - the offseason is officially here. With that of course comes the seemingly endless flow of trade proposal articles, and despite being on he precipice of serious contention, the Boston Celtics are right in the thick of the scrum of "potential destination" teams in almost every major trade conversation being floated. While some may simply be ridiculous, others would make sense if not for the collective bargaining agreement (CBA) existing, and tools to help us navigate the inevitability of poorly-thought-out trade proposals are especially helpful this time of year. 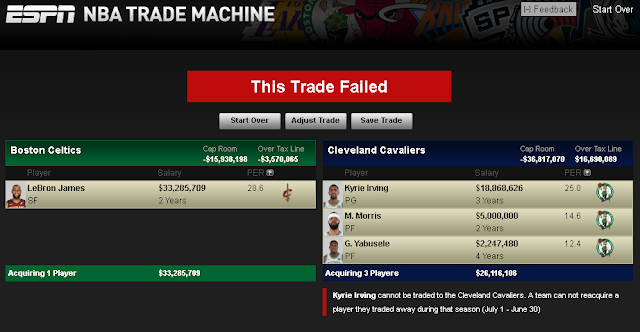 Most of us have been using ESPN's "trade machine" for years now, but it's a bit of a pain at times, forcing us to accept key players would not waive a "no trade" clause no matter what...for a fictitious exercise on a web page we're mainly there for to make sure the salary works. Of course for the purposes of a trade proposal we want to know if there's a rule that will always prevent a deal from happening, but this is a bit much given the circumstances. More I think about LeBron James to #Celtics report, most interesting detail to me is no reputable, plugged in #NBA reporters have squashed the possibility. All that means is this: James landing in Boston still VERY unlikely, but a conversation with Danny Ainge seems inevitable. Then, there's always the matter of sweeteners - in reality, we all know almost any deal going down in the NBA won't just be a player-for-player swap, particularly in such a cap constricted environment. Enter incentives, from cash to draft picks - just about any deal will have to include them, yet for ESPN's Trade Machine, you'd better have your own list of every team's available assets handy (or know where to look for them), because in ESPN's reality, they aren't even part of the process. Earlier this week, I stumbled across an interesting trade checker someone just came up with recently, and thought I'd share it with you all, given the spike in need many of us are going to have for something like ESPN's Trade Machine - and I bet that a lot of you, like me, have been hoping for something better for some time now, too. TradeNBA.com may be the tool you are looking for, then. Let me note I am not here on behalf of the creator, nor have they paid me a cent to promote their page - it just does what ESPN's does...better. 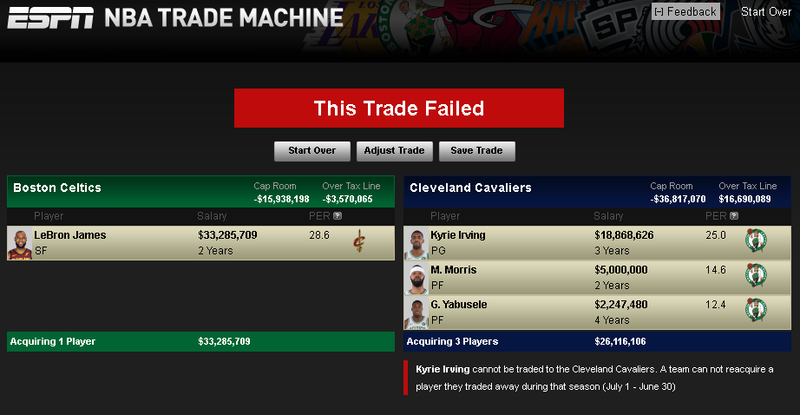 Those annoying "no-trade" clause jam-ups? Gone. (You still can't complete trades disallowed by date, making long-term move planning an issue, though.) Want to know (and include) any of the teams you are working with available draft picks in a proposal without having to spend an hour checking the internet and then typing them after the fact yourself? It can do that too, providing years left on a player's contract and PER as well as salary as ESPN's does. I will say that we still don't know how quickly it'll get updated (especially in the busiest parts of trade season, and, conversely, when roster changes happen in the fall), but is a welcome addition into the standard postseason trade toolkit. In it, one should also consider using the RealGM Trade Checker, which allows one to bypass certain rules like no-trade clauses (or time-dependent limits, which TradeNBA.com cannot) while also allowing you to understand the rubric at play you are circumventing, a great way to learn about the CBA as you go. Unfortunately, it does not include draft picks, and none of these tools allow you to sort by remaining contract length, especially those with early-termination clauses and other such quirks. One day, someone will devise a tool with all these options, maybe even allowing a "league-wide" mode, where potential deals can be assembled by looking for candidates across remaining contract years, statistical and biometric data. Yes, I'm a nerd, it's true. What tools do you use to explore trade ideas and team-building exercises? Which do you recommend and why? What features would your ideal trade-checker have, and for what reason? Let us know in the comments below.